, a very learned German, was thg son of a peasant of Suabia, and born at Veringen in the county of Hohenzollern in 1493. He pursued his studies in Pfortsheim at the same time with Melancthon, which gave rise to a lasting friendship between them. He then went for farther instruction to Vienna, and there taking the degree of master in philosophy* was appointed Greek professor. Having embraced the protestant religion, he was exposed to many dangers; and particularly in Baden, of which he was some years rector of the school. He was thrown into prison at the instigation of the friars; but at the solicitation of the nobles of Hungary, was set at liberty, and retired to Wittemberg, where he had a conference with Luther and Melancthon. 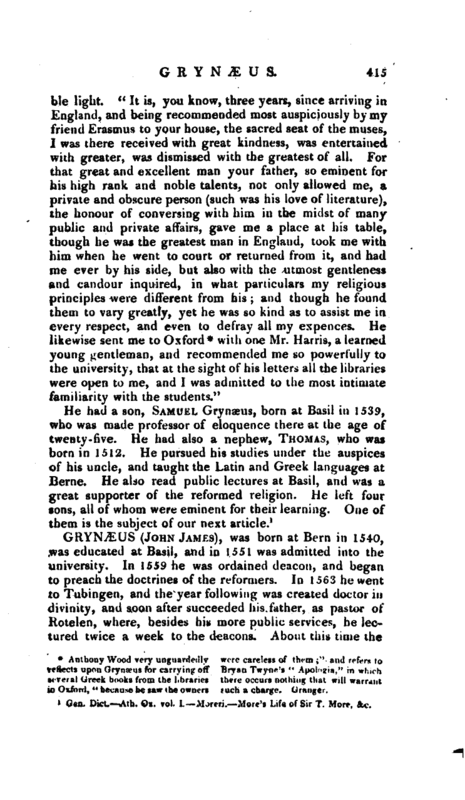 Being returned to his native country, he was invited to Heidelberg, to be Greek professor in that city, in 1523. He exercised this employment till 1529, when he was invited to Basil to teach publicly in that city. In 1531, he took a journey into England, and carried with him a recommendatory letter from Erasmus to William Montjoy, dated Friburg, March 18, 1531. 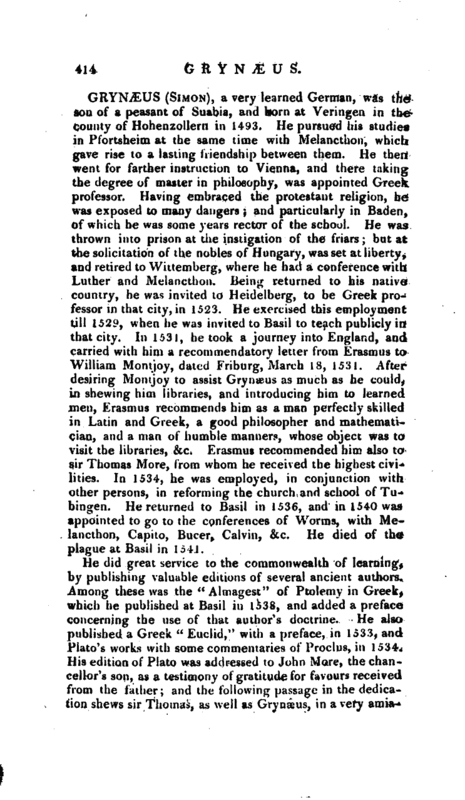 After desiring Montjoy to assist Grynaeus as much as he could, in shewing him libraries, and introducing him to learned men, Erasmus recommends him as a man perfectly skilled in Latin and Greek, a good philosopher and mathematician, and a man of humble manners, whose object was to visit the libraries, &c. Erasmus recommended him also to sir Thomas More, from whom he received the highest civilities, In 1534, he was employed, in conjunction with other persons, in reforming the church and school of Tubingen. He returned to Basil in 1536, and in 1540 was appointed to go to the conferences of Worms, with Melancthon, Capito, Bucer, Calvin, &c. He died, of the plague at Basil in 1541. Gen. Dict. Ath- Ox. vol. I. —Moreri. More’s Life of Sir T. More, &c.